Having lived in the UK for almost fifteen years, I’ve come to understand the importance of Tea. Not the “tea” I was accustomed to drink in The Netherlands: a tea bag is briefly suspended in a glass cup of water gone off the boil, resulting in a light-brown warm liquid. Of course, the tea bag is used to make not one, not two, but three cups of said liquid. Adding milk is only for children under ten. Tea it ain’t! It’s like taking your shoes off and dipping your toe in the sea, and pretending that’s the same as doing a mile-long swim in the sea. Not only that, I’m quite sure it’s only the British who solve any emotional distress with a “cuppa to cheer you up.” Luckily I have seen the error of my way a long time ago, and now much prefer a “builder’s tea” without, however, the regulation two spoons of sugar. 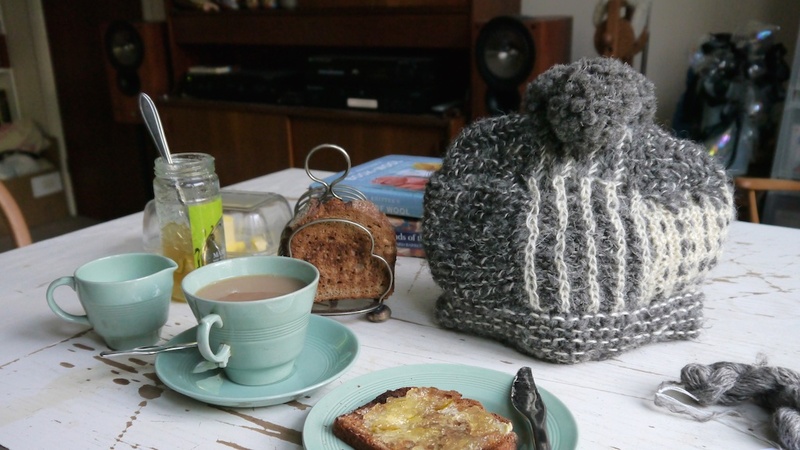 Wool is a good way of keeping your tea warm! 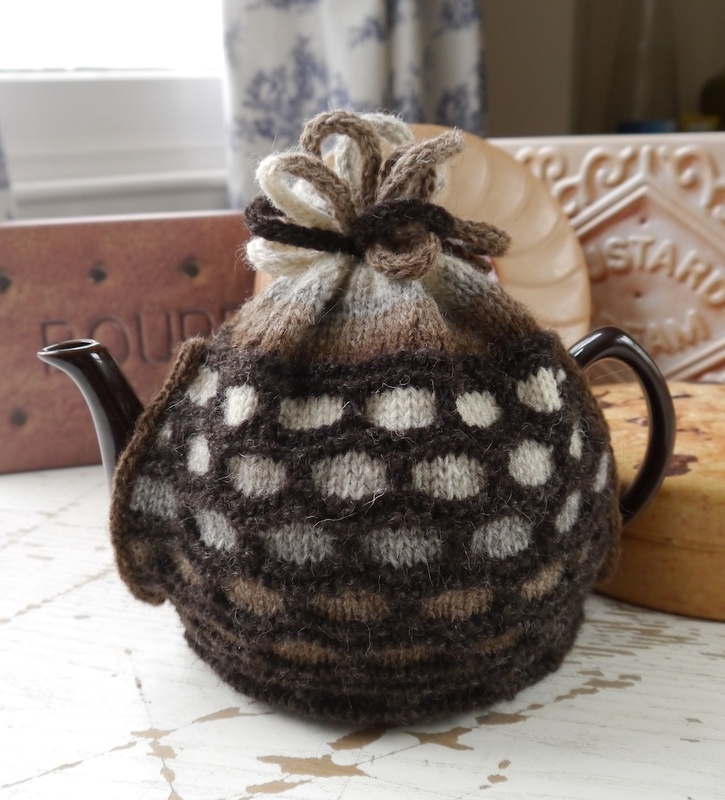 We regularly make a pot of tea here at Casa Tomofholland, and in order to keep it hot, I wanted to make a tea cosy. For some reason most tea cosies in the UK seem to be the kind that fits around the pot, with openings for the spout and the handle. Or maybe that’s just something that knitters do to show off their knitting prowess? However, we’ve been collecting Wood’s Ware crockery for a while now, in the Beryl colourway. Wood’s Ware is another English institution: it was the crockery of choice for many canteens in schools, hospitals and other communal spaces. Although it is no longer made, it’s easy to find the pieces secondhand and they’re not very expensive as so many were made over the years. 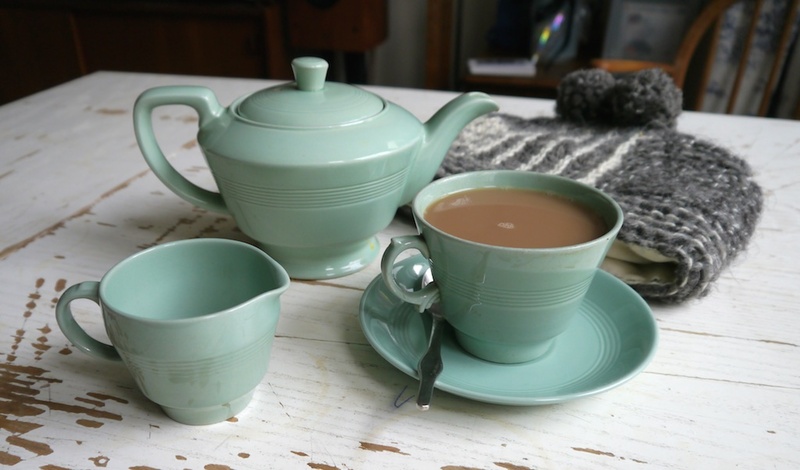 Although of a most unassuming colour and shape, I like the simple lines of the cups and saucers, tea and coffee pots, plates and tureens. I didn’t want to cover up my beloved teapot and hide what I like so much about it. 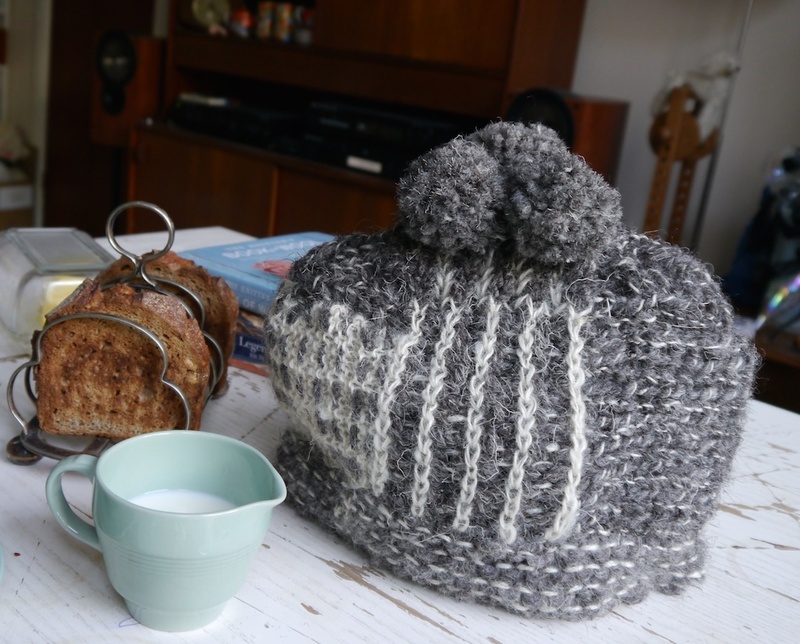 So I cast my mind back to when I was very young, and remembered the more usual tea cosies we used to use in The Netherlands (so there must have been a time where the Dutch drank proper Tea after all.) In Dutch they’re called a “theemuts,” which translates as “tea hat.’ And that’s really what they are: a hat for your tea pot, to be removed when you want to pour another brew. 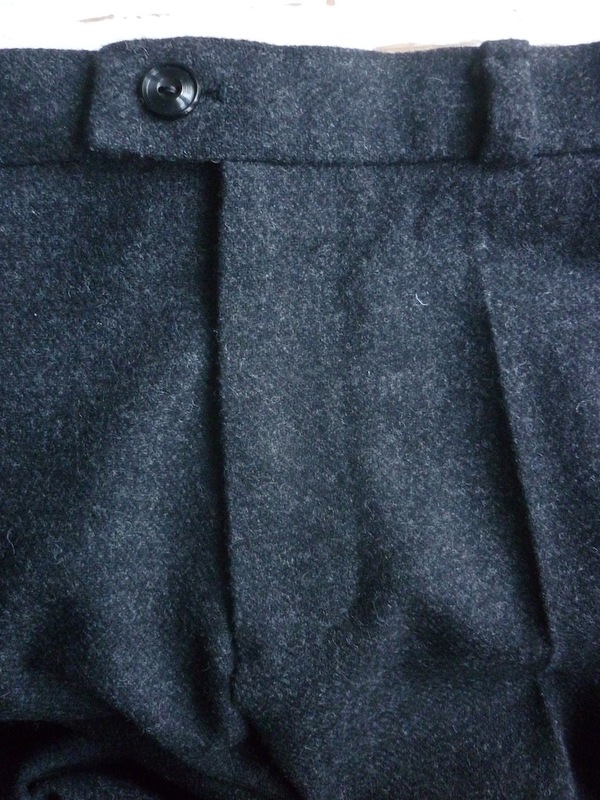 And what better material to make it from than wool? A perfect project for using some old handspun yarn; small skeins I had made a long time ago, trying out a few techniques. 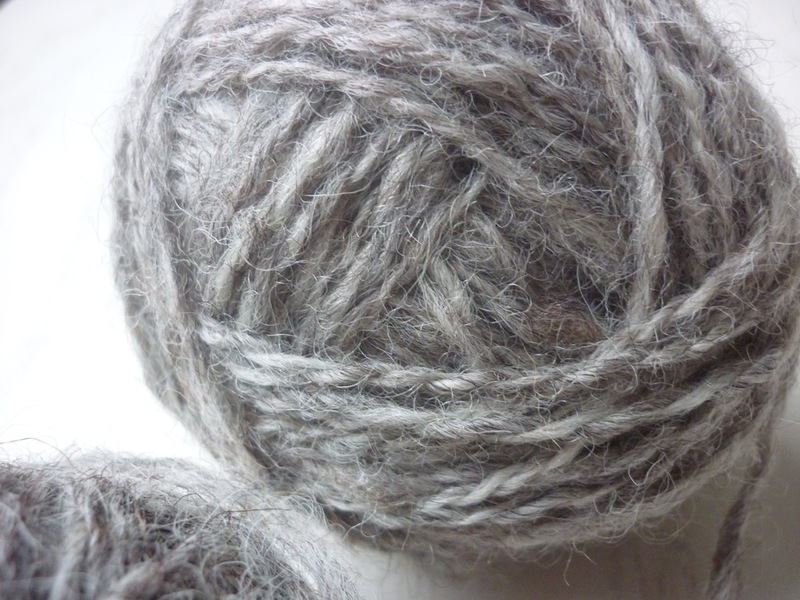 The grey is coarse Herdwick: a sturdy fibre with excellent insulating qualities. The creamy white is lustrous Wensleydale: also surprisingly sturdy, but very soft, too. 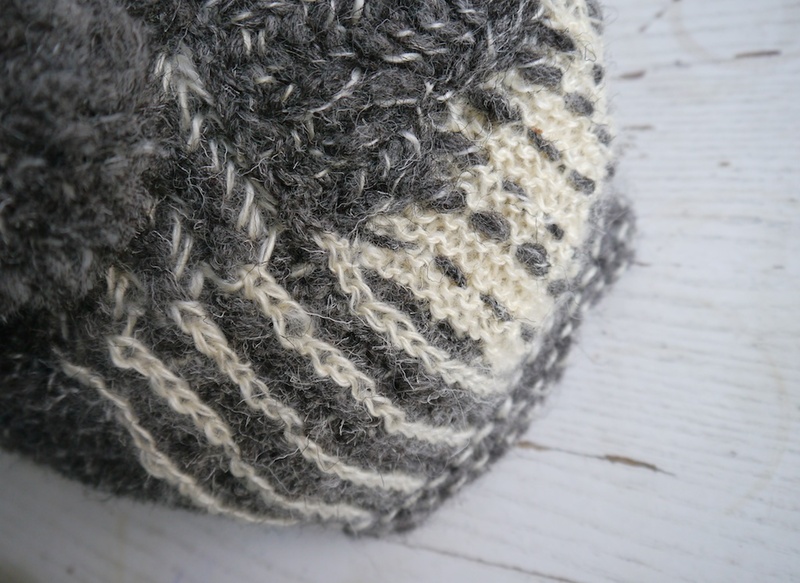 Apart from the appeal of using British rare sheep breed fibres, I was also reminded where the fibres came from when I knitted this up. The Herdwick was a gift from Victoria of Eden Cottage Yarns fame (who apparently has a shed full of fleeces.) 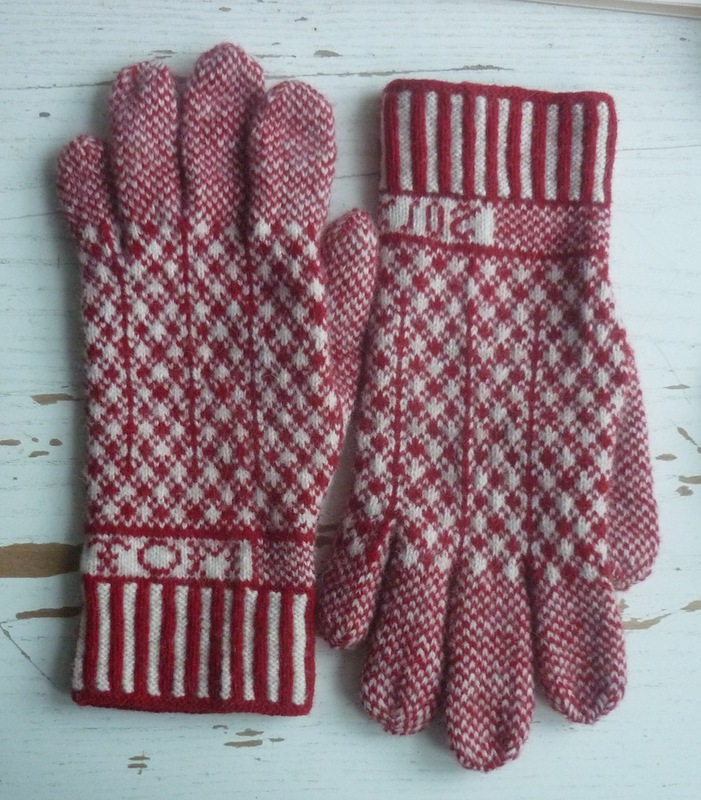 The Wensleydale was a gift from my dear friend and woolly comrade Felicity “Felix” Ford. She gave this to me when I became interested in spinning, and she was very enthusiastic about it, in a way only Felix can be. It was very infectious! It comes from Julia Desch’s flock of sheep, and her Wensleydale really is something else. 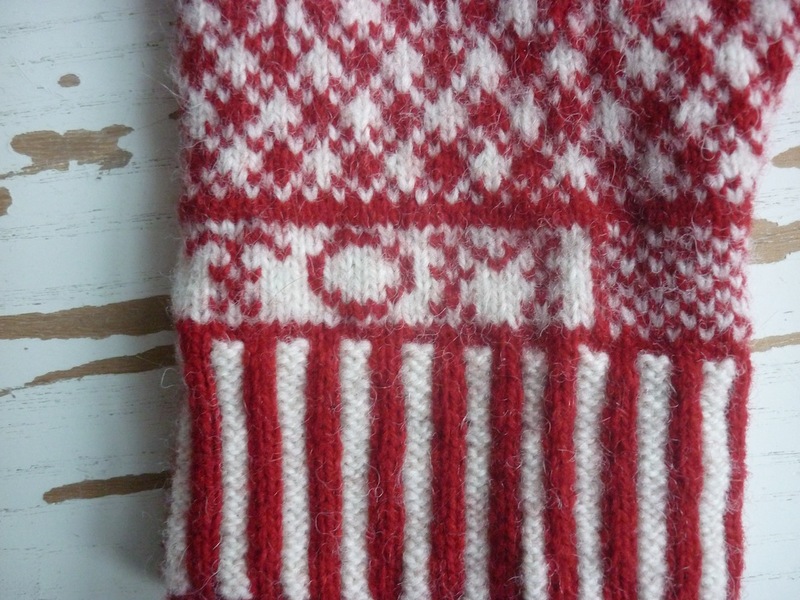 I also wanted to try out knitting two-colour brioche, and take another opportunity to do some free-form knitting. Apart from taking some rough measurements I didn’t plan anything upfront. 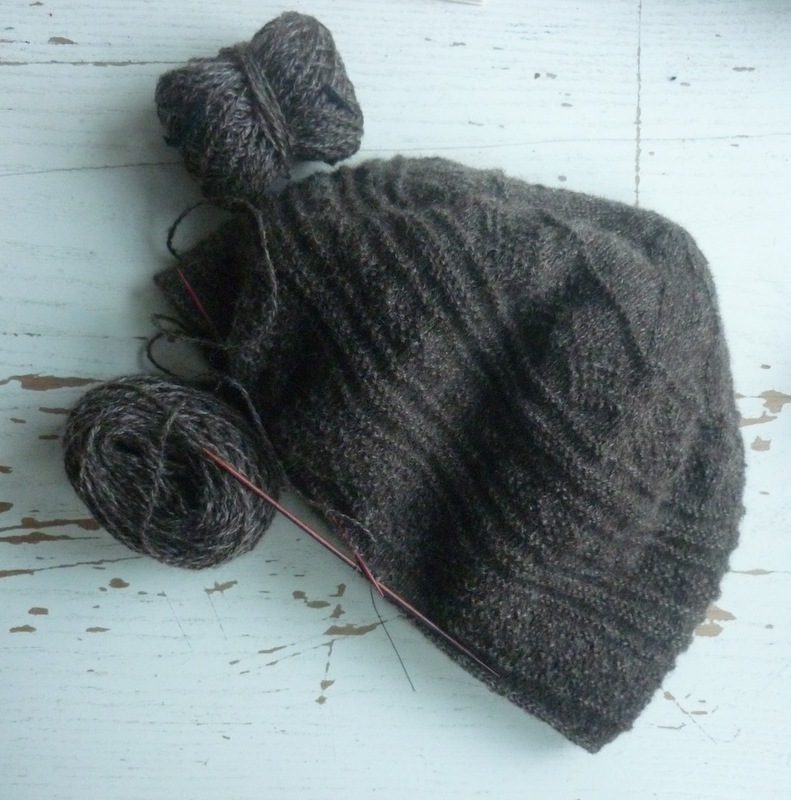 It soon became apparent that the very bulky Herwick yarns would not stretch to a whole Tea Hat in brioche stitch, so I ended up using a variety of stitches. 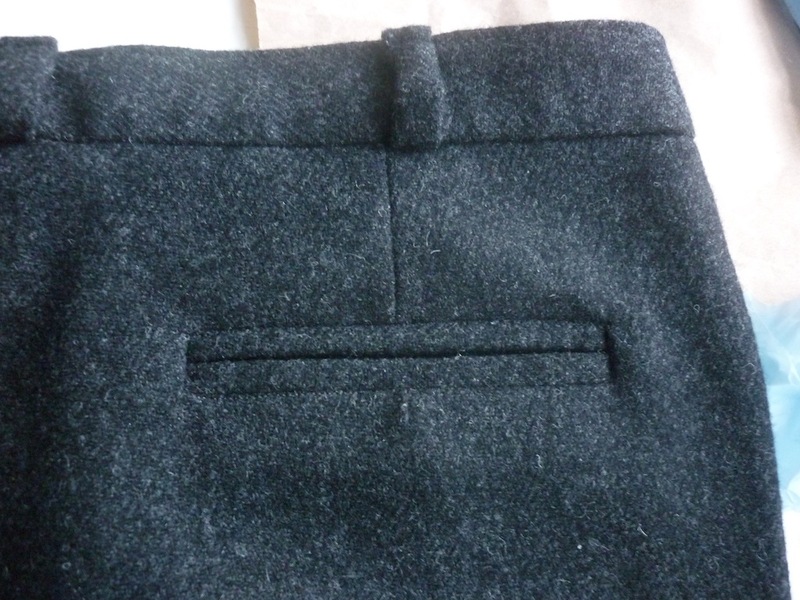 Some stocking stitch on one side, some garterstitch with woven in strands at the other. After the pompoms were made, I had quite literally used up all of my yarns, apart from the small scraps I trimmed off after sewing in the ends! I’m really pleased with this little folly of a Tea Hat. 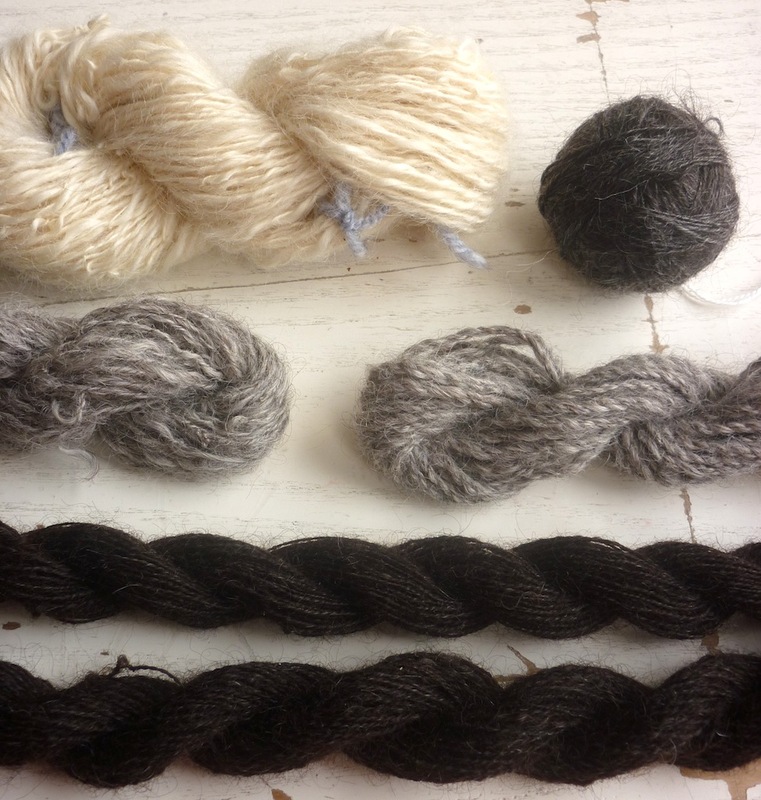 The interplay between bulky and thin yarn, the contrast between the rough Herdwick and slick Wensleydale, the lustre of a creamy longwool against the matte appearance of a fibre most often used for carpet yarn. I’m sure it will provide its warming service for years to come! First up, a selection of Herwick yarns. Herwick is a very hardy sheep breed, and is native to the Lake District. They have a very distinctive face, and their woolly coat is perfect for the rainy and windy conditions of their natural home. 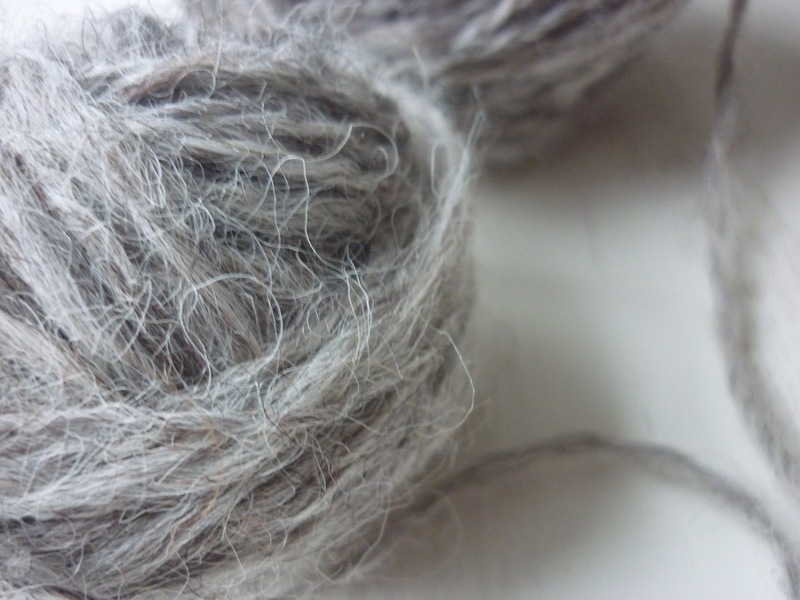 It contains a lot of kemp (white brittle fibres) and hair (dark smooth fibres) as well as wool fibres. The large amount of kemp and hair means rain runs off their coats very easily. 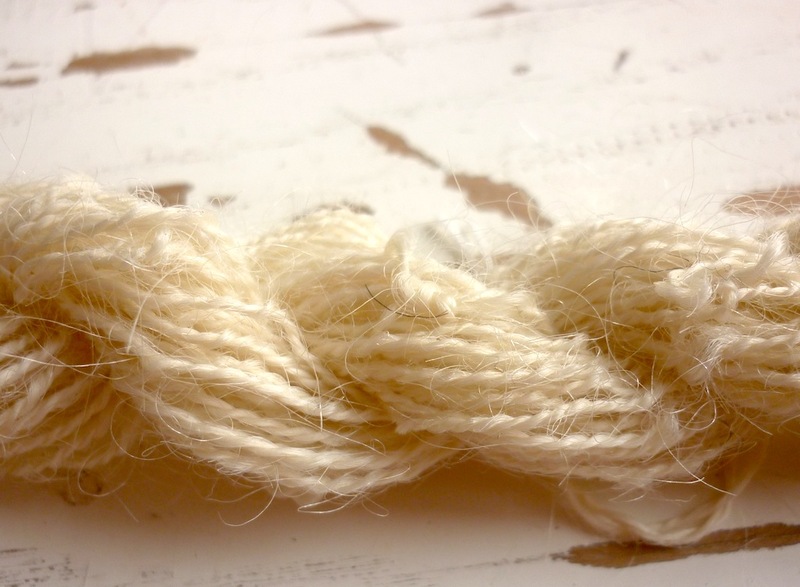 It also means, that resulting yarns can be very scratchy and are usually used for hardwearing carpets. This fibre was generously gifted to me by Vicky from Eden Cottage Yarns and she got the fleece from a Herdwick shepherd in the Lake District. 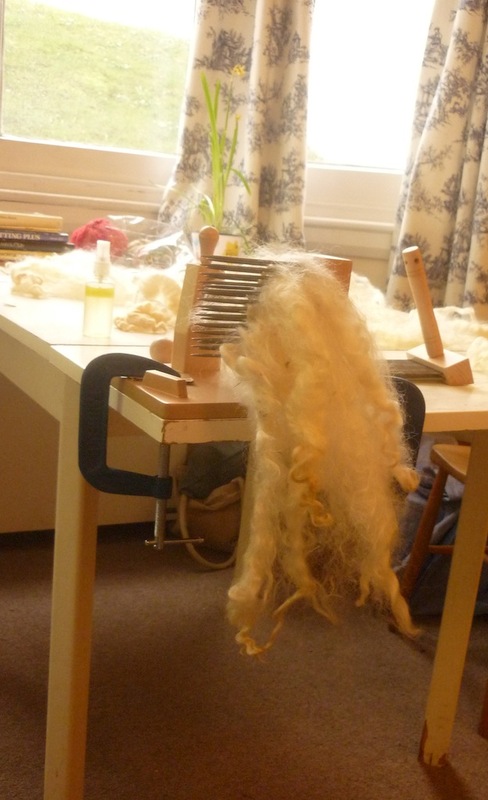 However, if you first comb the fibres, it is quite easy to separate most of the wool from the kemp and hair. The combing waste can then be carded. This means you can create some very different yarns, all from the same sheep. It’s amazing! You can see this in the picture above: on the right, a yarn made from the combed top, worsted spun, then plied. As I had a lot of combing waste, I could try out some different things. 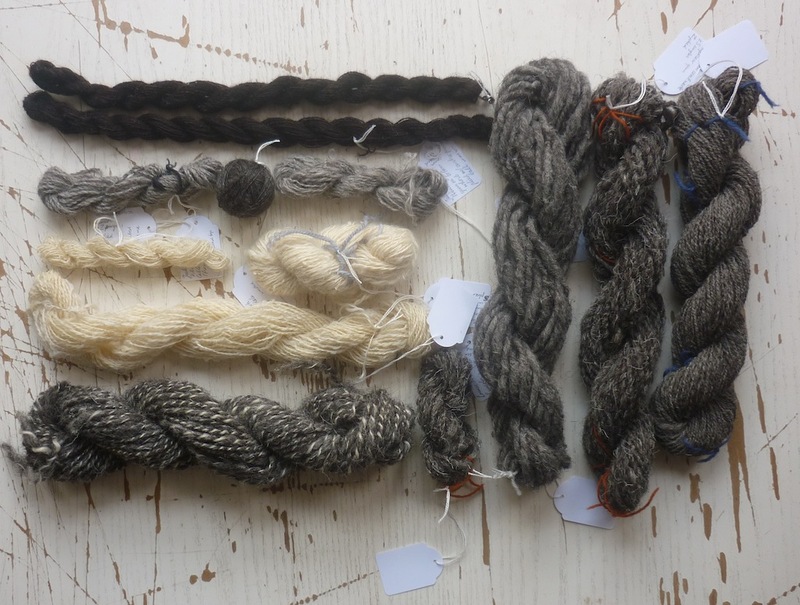 The skeins on the left and in the middle were both spun from carded fibre, and I made my first attempt at longdraw drafting, to create a woollen yarn. Admittedly, this is easier done on a spinning wheel, but it can be done with a spindle, and I kept the beginners technique of “park-and-draft” in mind for this, which is one way of achieving this. For the longdraw, I built up a lot of twist in the leader, then parked the spindle between my feet and slowly let the twist escape between my drafting fingers and run up into the rolag. Granted, this is not something to do for a long period of time, as it’s not a very ergonomical method. 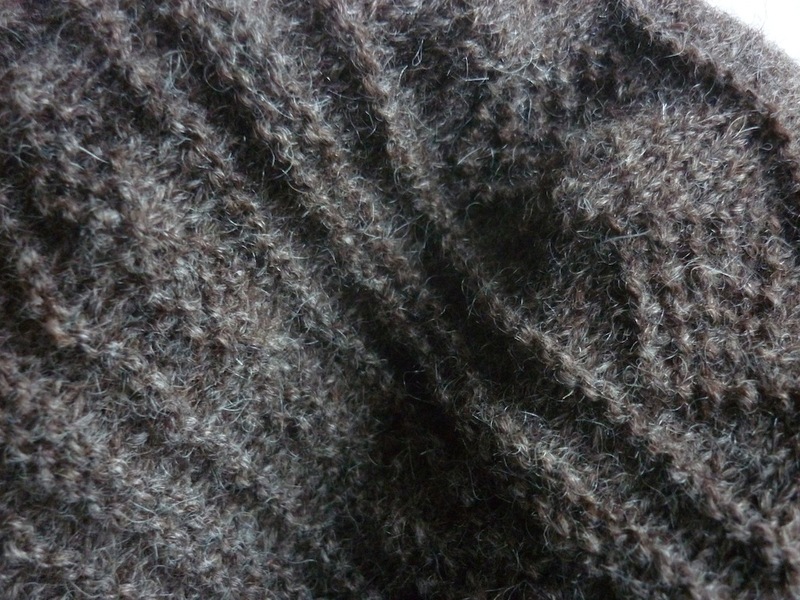 Then I finished the woollen singles in different ways. The skein on the left is a standard 2ply, the skein in the middle was felted by agitating the skein in hot soapy water and shocking it in a cold bath, followed by some wacking against the rim of our bath tub. 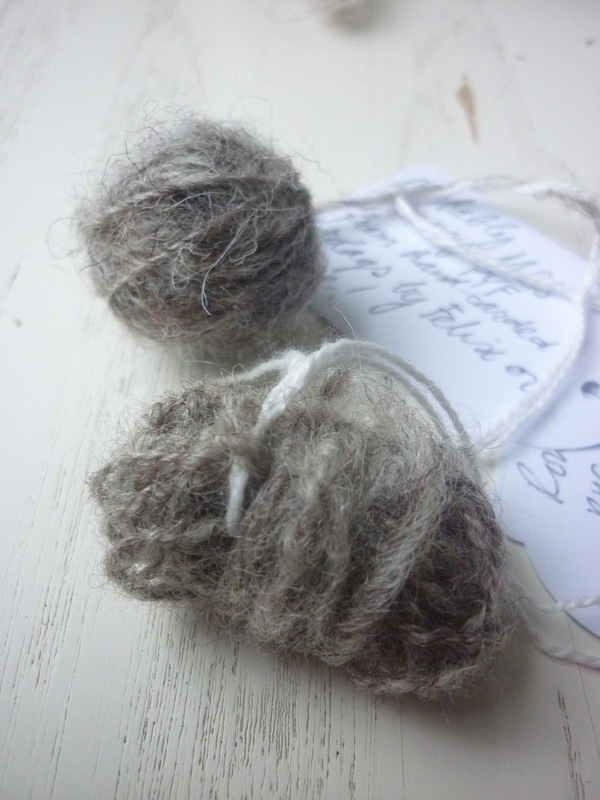 Another thing I tried was plying a fat woollen Herdwick single, with another classic British sheep breed: Lincoln. Lincoln is a typical longwool sheep, with lots of lustre. Longwools often don’t have any hair or kemp mixed in at all. Such a contrast to the Herdwick! I found the Lincoln quite a challenge to spin, as its staple length is quite fenomenal! But this is not the only longwool I played with. I also still had rather a lot of Wensleydale! 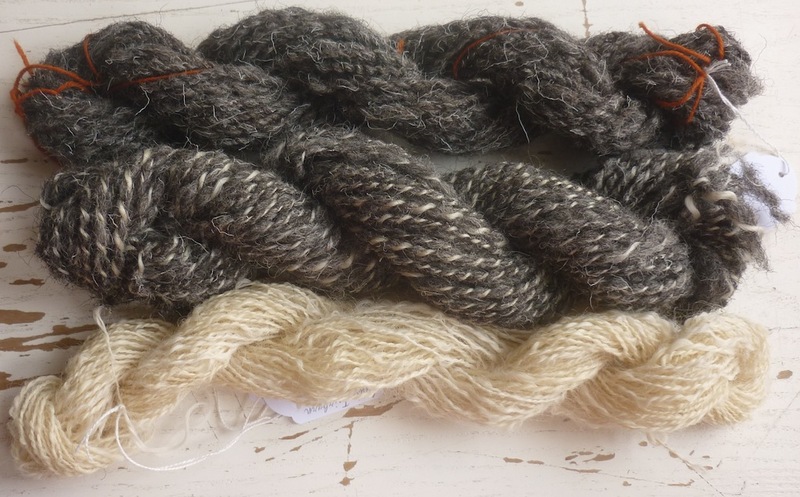 Wensleydale longwool in natural colours. I tried out quite a few things here, and this time, I struggled with the commercial preparation, as it is very slippy, and again, my spindle worked against me. This didn’t stop me from trying an intentional bouclé, made by plying up a S-spun and a Z-spun single. 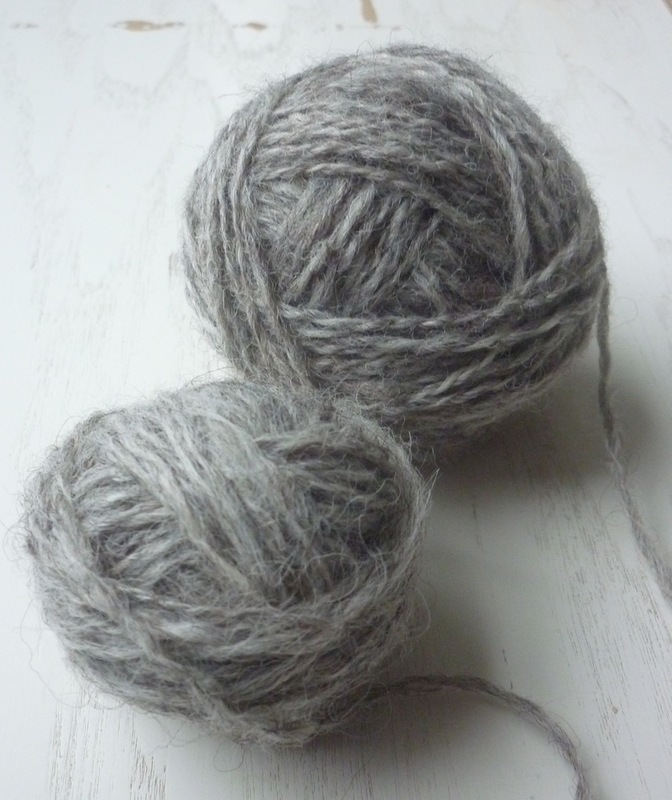 You can see it in the white skein, and in the grey skein on the left. I’m not so keen on how it came out, but I think there is still lots to be learnt about the amount of twist I put in both singles and the plied yarn. To be revisited in the future. 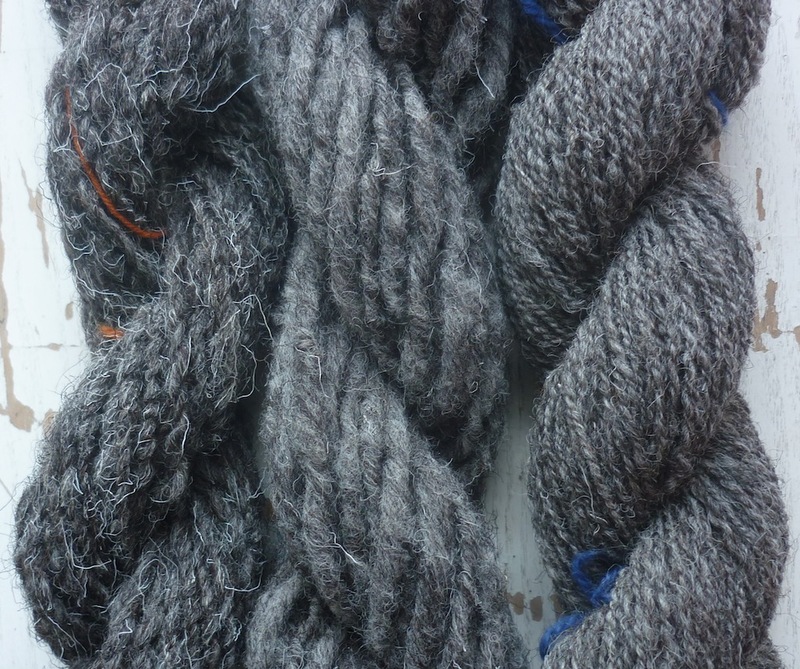 The grey skein on the right, however, I really love. It’s a cabled 4ply. My singles were Z-spun, then I created two 2ply yarns with an S-twist, and these got plied together with another Z-twist. Again, there is still lots of improvements to be made on the amount of twist at the various stages. After struggling with all the longwool and its slippery nature, I had to put aside the dark-brown Wensleydale as I wasn’t quite sure on how to improve. And I’m glad I did, as a few weeks ago Cecilia Hewitt, her husband Graham, Felix, Prick Your Finger‘s Rachael and yours truly all met up and we had a great time spinning and chatting and drinking tea. Cecilia explained a lot of things to me about spinning, and when working through my Wensleydale, I learnt about pre-drafting compacted fibres, checking the amount of twist you’re putting in, and last but not least, how a spindle that spins longer could help me deal with those long, slippery Wensleydale fibres! 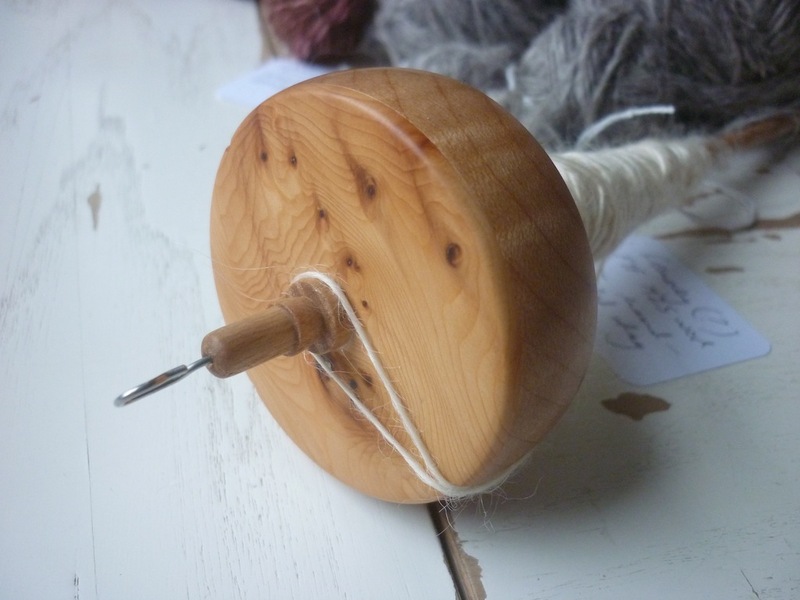 I’m very grateful for the bottom whorl spindle she gifted to me, as I really enjoyed spinning with it. As you can see, I managed to get some really nice lace-weight yarns. I tried two different methods of managing the two singles for plying up. I tried using a centre-pull ball, neatly wound up on a nostepinne. I didn’t enjoy the process of plying from this and you can see that in the left skein: it’s a bit hard and wiry. In fact I got so frustrated I just had to stop and wind the two ends of the centre-pull ball into two separate balls. 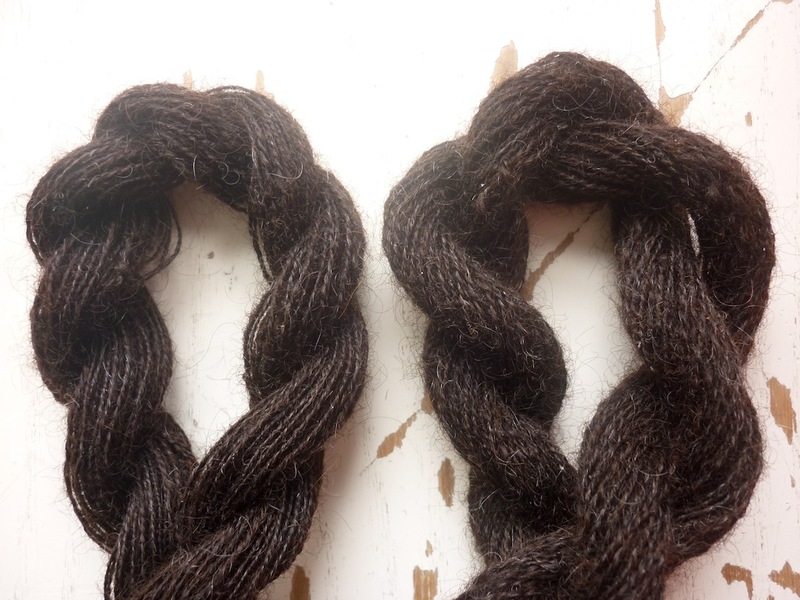 Lo’ and behold, the skein on the right looks much more relaxed and happy and you can feel that difference, too. Meanwhile I have combed the left-overs from the Lincoln, and carded some Shetland fleece, so I will soon have more spinning to share. 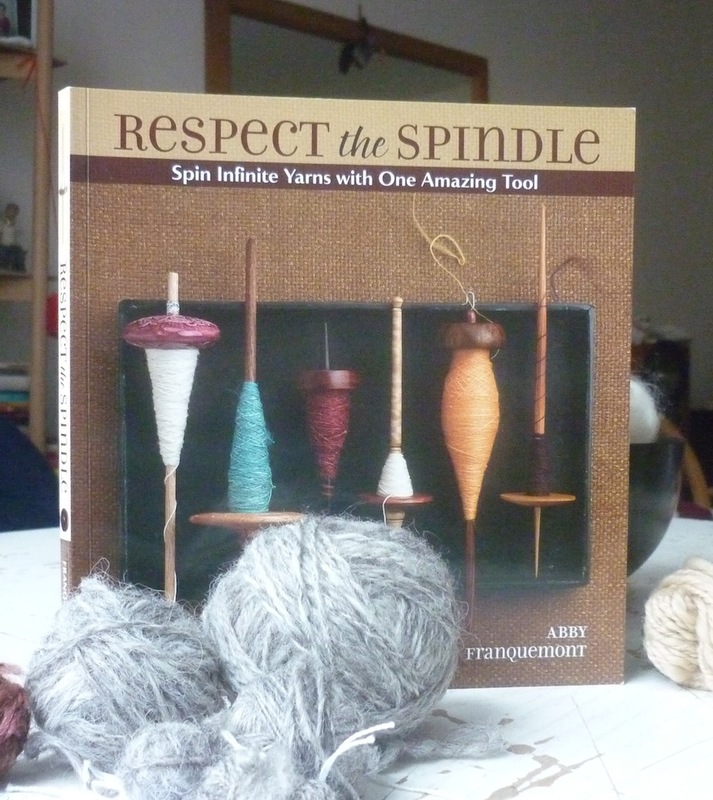 It’s Respect the Spindle, by Abby Franquemont, and she covers a lot of ground, going into great detail of the intricacies of spinning with a spindle. Well worth the investment if you when you’re starting out. At the same time my spindle arrived in the post, Felix had very kindly put together a parcel full of fibre to play with. It was all ready to be spun, so I didn’t have to worry about combing or carding it. As you can see, it’s is rather textured. 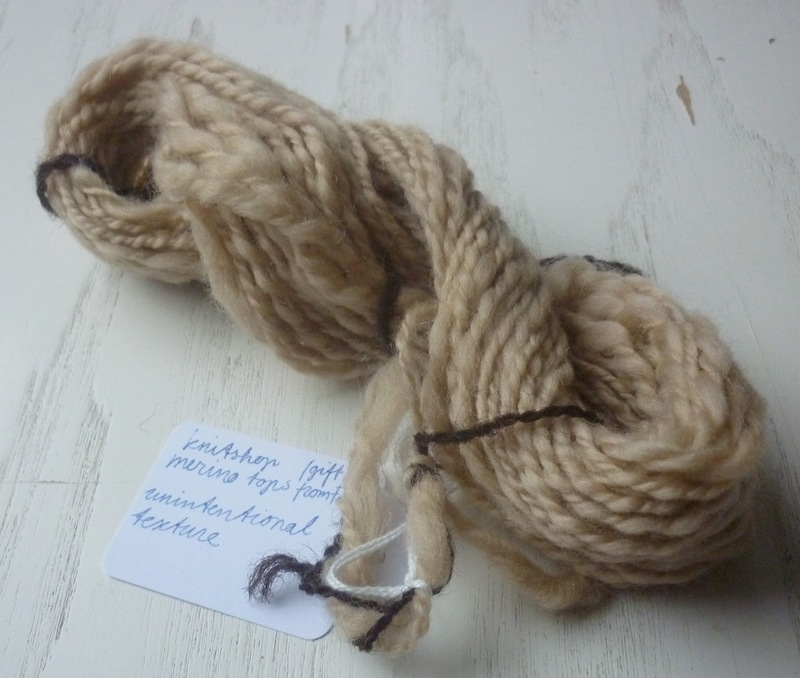 Anyone who spins will recognise the unintentional thick and thin nature of this first handspun yarn. But it didn’t take me that long to get more consistent; just spin for 15-30min each day and slowly but surely it starts to get easier and easier. I started of with the park-and-draft technique, explained in detail in Abby Franquemont’s video here. In fact, I find her video very instructional and although she made it well before her book was published, they go together well. I spun all the Merino, then some Masham, Jacob and also some Shetland: Felix’s parcel was stuffed full of goodies! M25 fleece, combed and spun by myself. Coarse fibre yarn at the front, finer fibre yarn at the back. 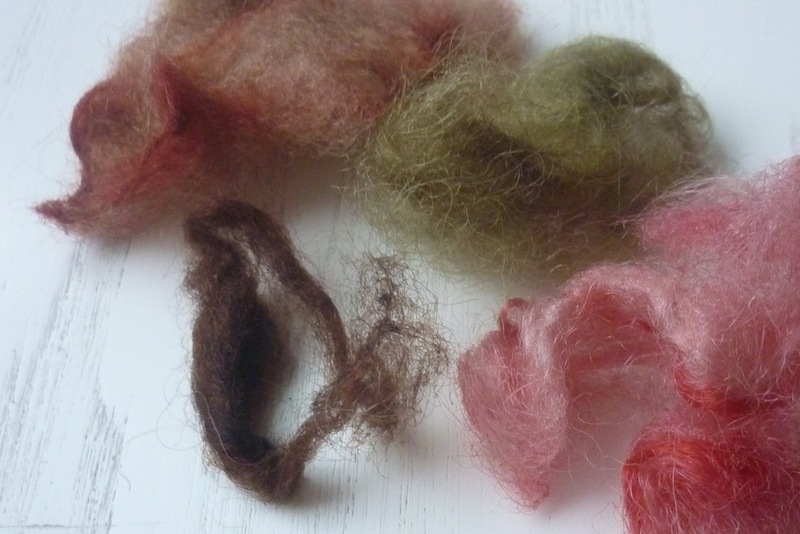 The browns are dyed using black walnut (I’m assuming the lighter brown is from a second dye bath), the green was made with now forgotten plants and the “crazy pink” from dylon cold dye. Although I think my main interest will be breed specific wool and their natural colours, I did enjoy spinning this up and playing around a bit. 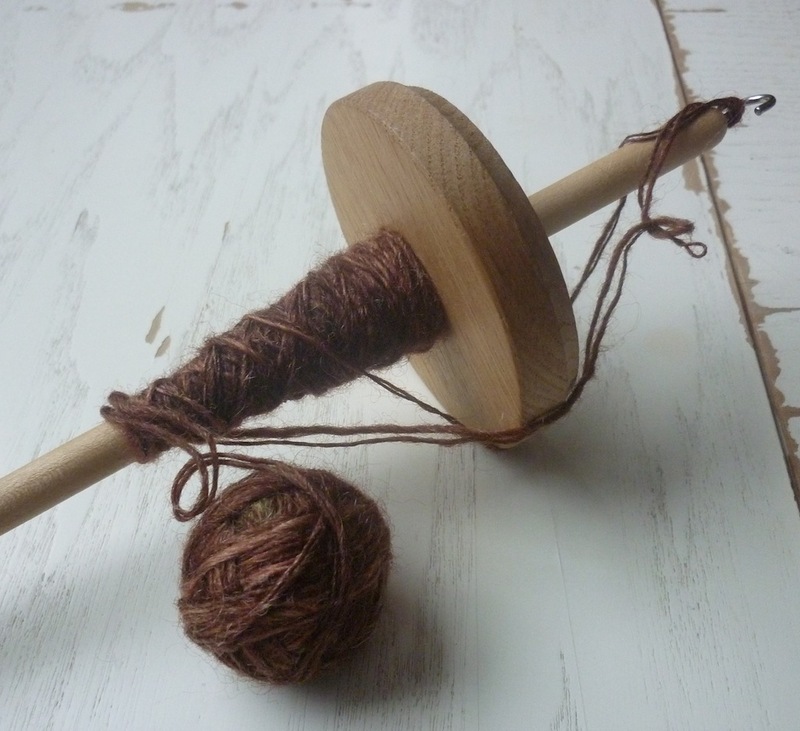 I found Cecilia Hewett’s series of posts on spinning for Wovember very inspirational. I particularly like the yarn she showed in part II, a yarn that appears to be brown from afar, yet up close it reveals a myriad of colours. Amazing! I mixed up the fibres by taking chunks of the combed tops and using them one after another for one single ply yarn, and then I made a much longer repeat on the second single ply. I have tried plying the yarns together from a centre pull ball but I don’t get on with that technique. Instead I followed Abby Franquemont’s advise of creating a plying ball. Simply wind the two single ply yarns together in a ball, making sure the tension is equal on both yarns; you can use a tennis ball or similar as a core for the plying ball, but I just started winding without it. You might already introduce a bit of twist when doing this, but once you’ve wound up your ball you are going to ply it proper on a spindle. As you can see, the Prick Your Finger spindle, which is larger and heavier than my IST spindle, is perfect for this. I created two small quantities of this coloured Portland yarn, one with a balanced twist, and one very much overtwisted in order to see what would happen. It will also allow me to try something out I have wanted to swatch for a long time: the bias effect that an overtwisted yarn introduces to a fabric knitted in stocking stitch. But that, dear readers, is the subject for another blog post. 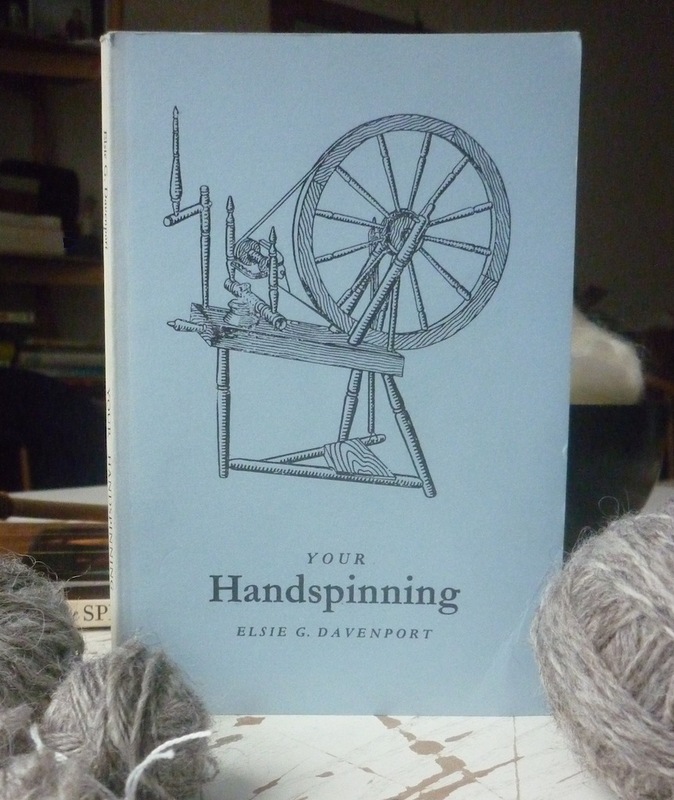 *) whilst I’m writing this post, two more books on spinning and preparing fibre are on the way. 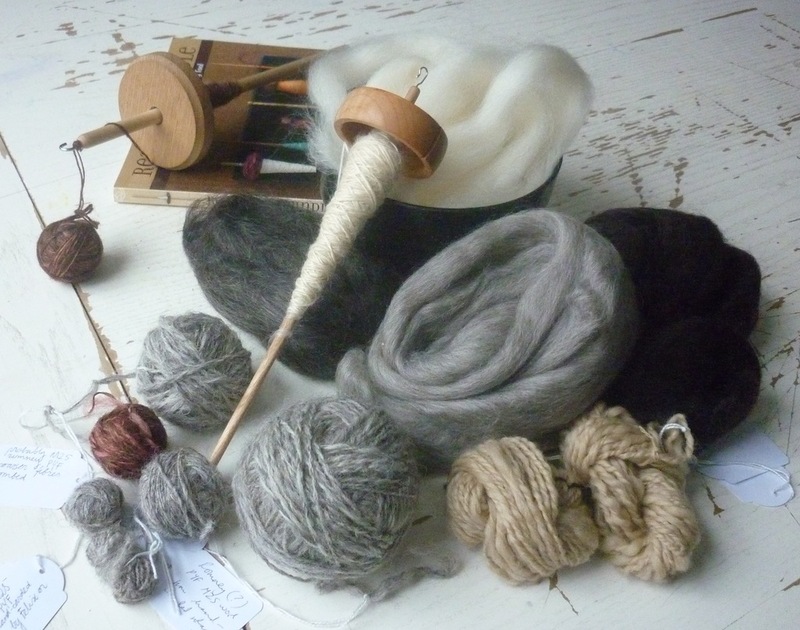 Peter Teal’s Hand Wool Combing and Spinning; and Judith MacKenzie’s The Intentional Spinner. Come on over at WOVEMBER, there’s even a competition going on where you can win all sorts of prizes by sending in a woolly picture!